2 part carbonless paper (white original & yellow copy) in your choice of red, green, blue, burgundy or black ink. Please make color selection at bottom of screen. Your company name, address, phone number(s) and license number imprinted at no additional charge. Size 5 1/2 x 8 1/2. Sold as loose sets or booked with wrap around covers. 50 sets per book. Make sure to choose booked on drop down quantity for this option. 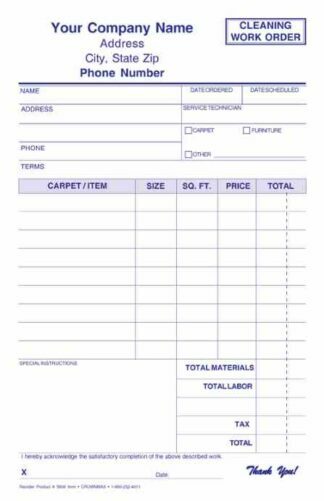 Note* The forms that we offer have been created and used by various cleaning companies. Please check wording to make sure that all applies to your company’s guidelines, city and / or state requirements before ordering. Most forms can be altered to fit your needs. Check with customer service for more details. Special Notice: We are looking to add new products to our Cleaning Professional Catalog. If you or your company has a current form or forms that you are using and would release us to re-sale your layout to other cleaning companies we will waive all typesetting fees for that form. 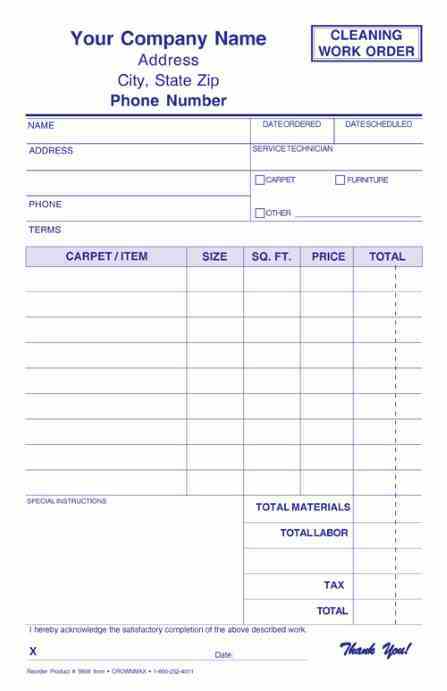 Email or Fax us a legible copy to artwork@crownmax.com or 1-800-760-1801 toll free fax for approval.